Only minutes from the Caves is a secluded retreat located in the heart of the Hocking Hills and away from the hustle and bustle of the city. Tucked back in the hillside of a lazy hollow sits a cabin awaiting the relaxation of its guests. Enjoy the privacy of the 20 acres of woods or relax on the front porch and watch for the deer to make their daily trek across the ravine. Autumn Ridge sleeps four and features a large stone fireplace, full kitchen with stove, refrigerator, microwave and dining area. There is a tv, queen size bed and 5-person spa. For guests who like to picnic, there is a charcoal grill, fire ring and picnic table. All linens are provided. In summary, we loved our visit, and can't wait to do it again. 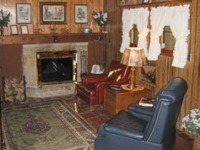 The owners are attentive to the needs of their guests, and very friendly. The cabin was quite clean, the hot tub was relaxing, and the cabin was full of any regular household item we could think of. Even with the cabin next to the owner's businesses, it still felt very secluded. 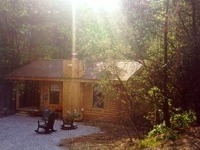 This was our first cabin in the hocking hills area, and we plan to only stay with Autumn Ridge in the future. One of the best places I've stayed in Hocking Hills area. Very clean and all the amenities you could think of. The best I've ever seen any where with customer service, owner involvement, and wiliness to do what it takes with in reason to make your stay more enjoyable. Can't see my family staying anywhere else in the future now that we've had the best! .